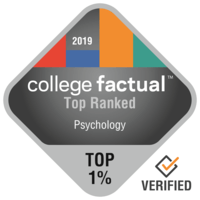 2019 Best General Psychology Colleges in the U.S.
With 112,957 graduations annually, General Psychology is quite popular. It is the 4th most frequent major from the 384 typical majors analyzed. If you're worried about after college income, pursuing General Psychology might not be your best option. The major is ranked 94 out of a total 121 programs regarding income potential, however, some schools could deliver superior outcomes than others, and students can improve their salary potential with further education. Below you'll see a list of the best colleges and universities to study General Psychology. Our ranking methodology takes into account education quality, average earnings of graduates, accreditation, and several other relevant factors. Searching for the very best? Consider Stanford University in order to pursue an education in General Psychology. Stanford University offers graduate degrees in psychology for those interested in an advanced degree. Based in Stanford, California, Stanford offers a dependable, suburban atmosphere for young people. Considering the fact that 7.0% of college grads have defaulted, Stanford's default rate of 1.0% is impressive. Stanford has a remarkable student-to-faculty ratio of 10:1, so students have lots of chances to network with their teachers. The scorecard provides a fantastic overview of Stanford University. University of California - Los Angeles is among your best bets if you're planning on studying General Psychology. Graduates of the psychology program make an average of $44,943 in their early career salary and $76,728 in their mid-career salary. The setting in an important urban center is great for young people seeking out considerable opportunities for social networking, adventure, and exploration. Vanderbilt University is a good option for students pursuing a General Psychology degree. Grads of the psychology program report average early career earnings of $44,211 and mid-career earnings of $85,980. Nashville, Tennessee is an excellent environment for students who enjoy the fast-paced urban lifestyle. This institution understands how to handle the specific needs of international students, since 7.1% of its undergraduate population comes from other countries. Vanderbilt University provides graduate degree programs for students who need to proceed after earning a bachelor's degree. Watch some school videos to learn more about what's happening on campus. Every student who is interested in General Psychology needs to check out University of Pennsylvania. University of Pennsylvania offers graduate degrees in psychology for those interested in an advanced degree. University of Pennsylvania is among the largest schools in Pennsylvania. Yale University is among your top options if you want to study General Psychology. Yale University general psychology graduates receive 41.8% more than the typical psychology grad. The setting in a large urban center is great for students seeking out considerable options for social networking, excitement, and exploration. Any student pursuing a degree in General Psychology needs to check out University of North Carolina at Chapel Hill. Students from the general psychology program at University of North Carolina at Chapel Hill earn 11.8% more than the typical college grad with the same degree. University of North Carolina at Chapel Hill is among the largest schools in North Carolina. Student achievements after graduation is significant to University of North Carolina at Chapel Hill, with graduates typically leaving the university with student loan debt lower than the U.S. average. The student body at University of North Carolina at Chapel Hill is remarkably diverse and includes undergraduates from over 42 U.S. states and 46 nations around the world. Find out about what student life at UNC Chapel Hill is like by enjoying some campus videos. Duke University is a great option for students pursuing a General Psychology degree. In addition to its bachelor's programs, Duke University offers graduate degrees in Psychology. The setting in a big urban center is wonderful for students seeking ample chances for networking, experience, and discovery. This school is well-known for its support of military personnel and is the 765 best in the nation for veterans. Sports fans will enjoy watching the university's top-ranked men's basketball team as they play at home and on the road. Videos from Duke could be a great way to get more information about the university. Brandeis University is one of the finest schools in the country for General Psychology. Graduates from the general psychology major at Brandeis University get 10.4% more than the standard college grad in this field. Based in Waltham, Massachusetts, this university is a good choice for students who thrive in an urban atmosphere. Because of its affordable price and fantastic instructional programs, Brandeis University is a fantastic bargain, attaining a rank of #32 in Massachusetts. There is an advanced degree program obtainable for those who are intrigued. For details, check out the college scorecard. It's hard to beat University of California - Berkeley if you want to pursue General Psychology as a major. Students who graduate from the psychology program earn an average of $44,820 in their early career salary and $92,217 in their mid-career salary. University of California - Berkeley has one of the largest student bodies in California. University of Virginia - Main Campus is a good choice for individuals interested in a General Psychology major. University of Virginia - Main Campus offers graduate degrees in psychology for those interested in an advanced degree. University of Virginia - Main Campus is among the largest schools in Virginia. Close to 96.0% of first-year students decide to come back to University of Virginia - Main Campus for their sophomore year of school. The low net price of $24,383 for University of Virginia - Main Campus is excellent for students who consider cost as one of their biggest concerns. Get a better idea of what student life at University of Virginia is like by enjoying some campus videos.